Blitworks has revealed that it is bringing Crackshell's Hammerwatch to the Nintendo Switch next week. The pixel-rich fantasy action title sees you taking down hundreds of enemies as you attempt to storm the castle of Hammerwatch. 6 character classes are available, as well as a new one - Sorcerer - which is being introduced for the console ports. The game is coming to the PS4 and Xbox One as well as Nintendo's machine. Local multiplayer for up to four players is supported, and online multiplayer is coming in the future. The console editions will also benefit from balance changes and improved artwork. 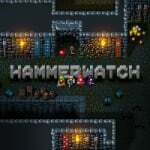 Hammerwatch launches on Switch on December 14th in America and on December 23th in Europe, and will cost $9.99 / 9.99€. Wow that music is super catchy! Is it ok for single player? I have it on Steam as well and I like to play this game with my daughters ! Very fun in co-op ! Yes it's totally fine as single player. The question is if this supports the add-on content and fan made levels. I think it will be great on the switch, really enjoy the music and the gameplay. Price is also great, probably I will take it. Regarding the single player, probably will be challenging which is nice in my opinion. My wife and I were just talking about replaying this. Since it comes with a new character, I think I'm in. I love Hammerwatch. I've played it three or four times on PC with friends and solo. Will be purchasing this immediately when it is released. I'd need that to double-dip, but then it'd be an instabuy too. I love this game on steam, so it’s a day one pickup on my switch! Sweet since gungeon won't come out I'll get this. What? A port of a game I really like? Again? @kukabuksilaks I hope cross play is implemented. I'd definitely double dip. My wife loves this game and playing it on consoles would be amazing.